The Gran Premio Red Bull de España saw Valentino Rossi lead from start to finish, winning from Lorenzo and Marquez with ease. All weekend the leading three were in a league of their own. Rossi, Lorenzo and Marquez had filled the top three of almost every practice session and lined up next to each other on the front row of the grid. The three biggest names in MotoGP™ were alongside each other once more and everything in practice had indicated that there was almost nothing to choose between them. As is typical of the Spanish GP, the grid was packed with mechanics, guests and officials but the riders did their best to block it out and run through their race plans. With all three on the same hard front and medium rear tyres, managing tyre life could very well decide the race but those concerns would come later. The sun beat down on the grid and getting into, and out of, Turn 1 quickly and safety was all any of the MotoGP™ riders were worrying about. Races can’t be won in the first corner, but they can certainly be lost. Right hands gripped throttles; riders leaned forward and tensed as the lights came on. Off the lights went, the crowd erupting into applause and cheers as Valentino Rossi made a great start to lead into Turn 1. But he wasn’t alone Jorge Lorenzo right behind with Repsol Honda Team duo Marc Marquez and Dani Pedrosa within touching distance. Perhaps the best start of the race was from Pedrosa who quickly put his RC213V into third midway through the first lap. Across the line they went as the second lap began as the Movistar Yamaha MotoGP pair stretched their lead. Marquez attacked Pedrosa into Turn 6, running wide as his line was blocked. Through Turn 9 Lorenzo launched a similar attack on Rossi, the Italian holding off his teammate as the Hondas clawed back the gap with Marquez now in third. Fans were transfixed on the leading four, few noticing the incredible start of Eugene Laverty (Aspar Team MotoGP) who was in eighth as the third lap began and the leading Independent Team rider. Andrea Dovizioso (Ducati Team) chasing Aleix Espargaro (Team Suzuki Ecstar) for fifth with Maverick Viñales (Team Suzuki Ecstar) on the tail of his Ducati. Dovizioso’s teammate, Andrea Iannone (Ducati Team) was having a terrible race, dropping like a stone down to 14th in the opening laps. All of the leaders lapped in the mid 1’40s, Rossi trying to escape as Marquez looked for a way through on Lorenzo. His lead would soon be over half a second, Rossi upping his pace lap after lap and drawing out hundredths of a second at each corner. Before long the gap was at a second, Valentino Rossi seemingly doing as his teammate had done before and breaking the field early in the race. No matter what Lorenzo did he was unable to close in on Rossi nor shake off Marquez. Disaster for Dovizioso on the tenth lap as yet again, through no fault of his own, his race came to an end. The factory Ducati rider was forced to sit up as his Desmosedici GP encountered a terminal issue, forcing him to ride back into the pits and once again make the long walk across the garage to spectate the race once again. Rossi and his team had focused on race setting throughout the weekend, ‘The Doctor’s’ work paying off as the gap soon grew to over two seconds as no one was able to match his lap times. Behind him Lorenzo had his hands full fending off Marquez, the Repsol Honda rider not quite close enough to attack but applying ample pressure. Overtakes were scarce at the front but the battle for seventh place produced some thrilling racing, Pol Espargaro (Monster Yamaha Tech 3) leading the group ahead of Laverty. 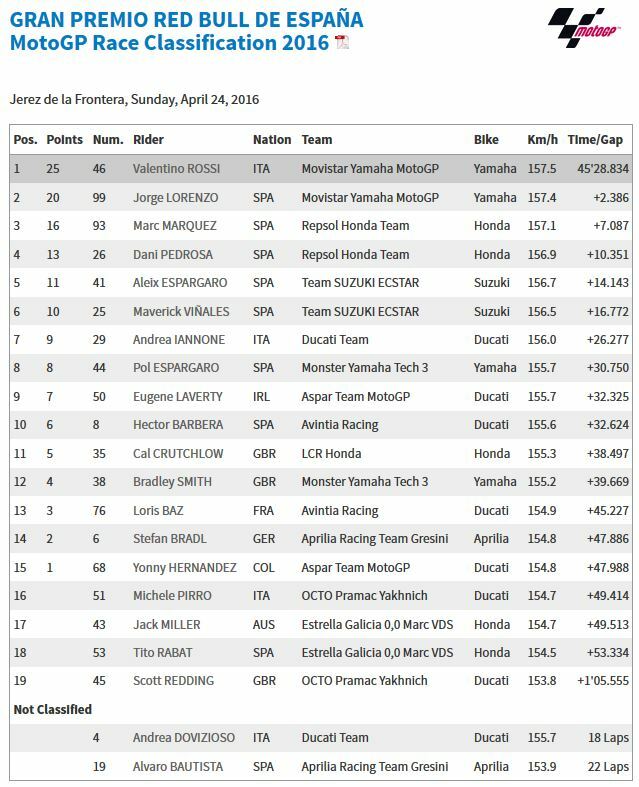 Just behind them Andrea Iannone and Cal Crutchlow (LCR Honda) pushed each other hard for 10th position, not what either rider wanted before the race. Ahead of them Pedrosa had Aleix Espargaro to contend with, Pedrosa working hard to hold off the Suzuki man. Since his fifth in Austin, Espargaro has been in some of the best form of his career after a setup breakthrough. With over half race distance gone, Lorenzo broke Marquez and opened up a one second lead on his fellow Spaniard. Marquez had chosen to run winglets on his Honda which assisted with keeping the front down but also ran the risk of overheating the front tyre over the race. With ten laps to go, Lorenzo hadn’t just broken Marquez but he also began to close in on Rossi. A gap that was one three seconds quickly dropped to two and that gap continued to fall by a couple of tenths a lap, would it be enough with eight laps remaining? Chances of victory would fade as Rossi responded to Lorenzo’s increased pace and once again dropped into the low 1’41s. The gap would again grow to over three seconds, Lorenzo seemingly happy to settle for second and take valuable championship points. Marquez also continued to drop back, his chances of a home victory long gone as he found himself over five second behind Lorenzo. After a terrible start to the race, Iannone set about making up for lost time and quickly got past Pol Espargaro (Monster Yamaha Tech 3) and ran away with seventh place. This would be one of the last battles of the race as the field stretched out, only a handful of riders within a second of each other. 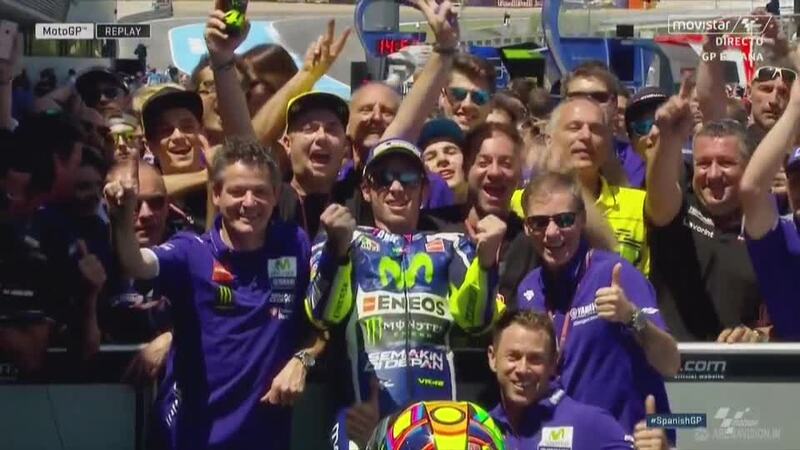 For the 113th time in his career and the 87th time in the premier class, Valentino Rossi pulled a wheelie across the line to celebrate victory. After the disappointment of Austin, the result is exactly what ‘The Doctor’ needed. Behind him Jorge Lorenzo took his 100th premier class podium finish and Marquez was able to keep the lead of the Championship, his lead reduced slightly to 17 points. Alvaro Bautista (Aprilia Racing Team Gresini) crashed out of the race at Turn 11 after battling with Cal Crutchlow in the opening stages. The Monster Energy Grand Prix de France will seem them do it all again for round five of the 2016 World Championship.